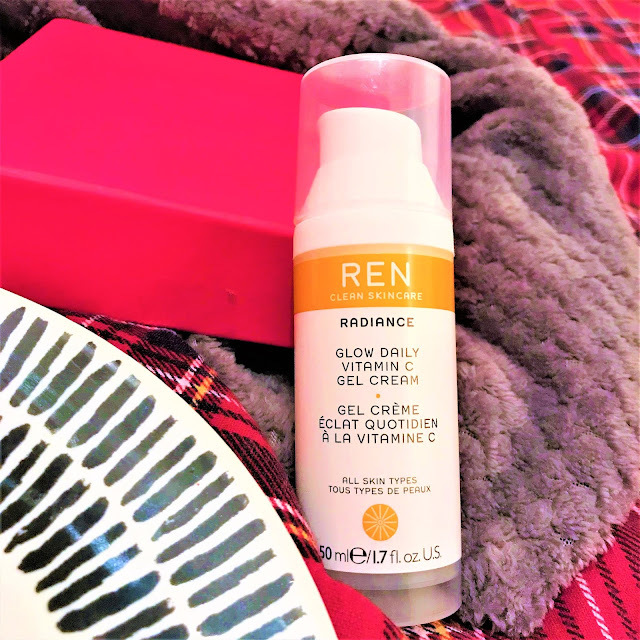 First up is the REN Glow Daily Vitamin C Gel Cream*. A new addition into my skincare routine, and a definite game changing product for those with dull and tired looking skin. It's packed full of essential vitamins minerals that help boost a radiant and glowy complexion. Full of Tara Pod Extract, Vitamin C and Magnesium, helping to even out skin tone, illuminate the complexion and nourish the skin. The REN Glow Daily Vitamin C Gel Cream has a light and natural fresh scent with a hint of zesty and juicy oranges. Sounds delicious right?! When applying to the skin, a little goes a long way, so you only need the smallest amount for a full face. A perfect lightweight and fast absorbing cream, anything with the words 'radiance' and 'glow' are a perfect winter treat that helps you get that summer glow all year round! 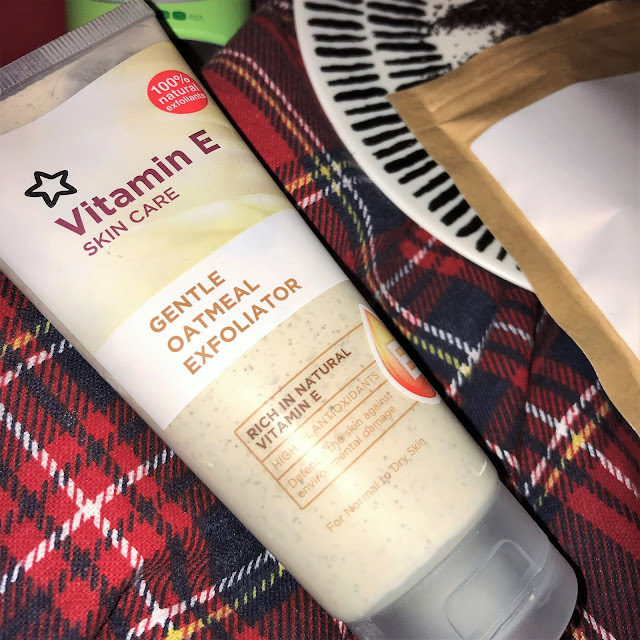 Next, I've been using the Superdrug Vitamin E Gentle Oatmeal Exfoliator. At a bargain price of £2.99, this has been one of my best drugstore finds in terms of skincare. Vitamin E Exfoliating Facial Scrub uses oatmeal to provide gentle but effective exfoliation, revealing deeply cleansed, soft and radiant skin. I use this twice a week after I've cleansed my skin, and it leaves me feeling super plump and smooth, that my moisturiser or serum glides effortlessly across my cleansed skin. My third winter skincare essential is a nourishing hand cream. I always carry one with me in my bag for when I'm out and about, as they're perfect for when you're travelling or on the go. 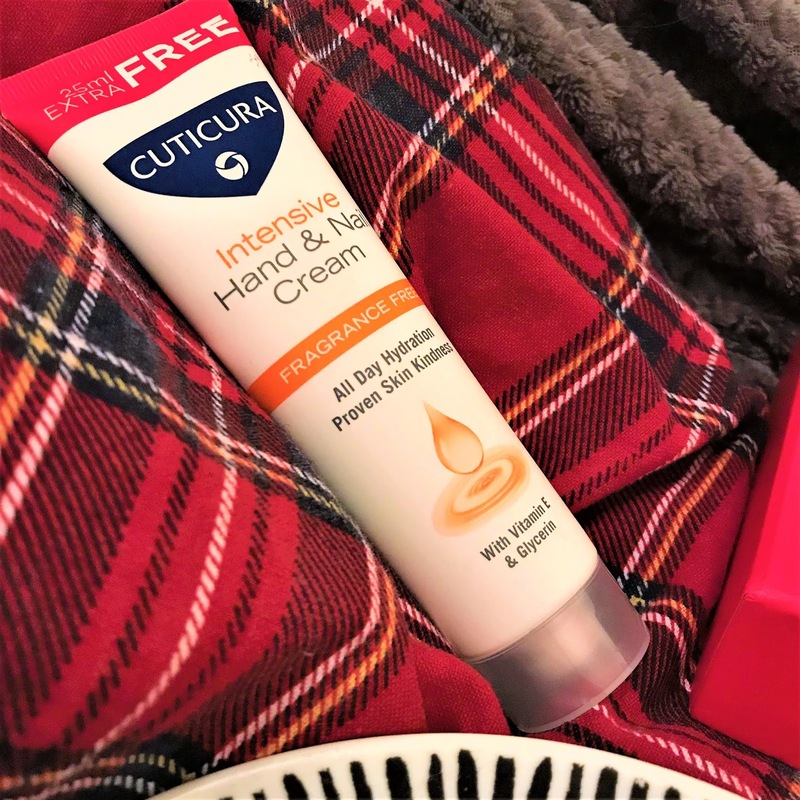 Recently I've picked up the Cuticura Intensive Hand & Nail Cream which I found when browsing my local Poundland store. Packed with Vitamin E and Glycerin; a perfect combination to keep your hands moisturised and nourished all day long. Another essential for me is a body scrub. I go through so many of these as I love the feeling of silky, soft and smooth skin. 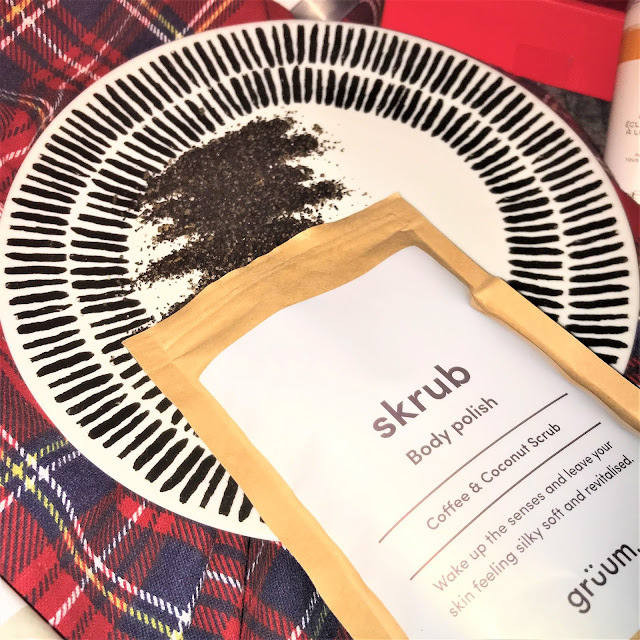 Currently I'm using the Grüum Coffee & Coconut Body Polish Scrub. Packed with Robusta Coffee, Cane Sugar, Dead Sea Salt, Argan oil, Macadamia oil and Cocoa Butter, it's the perfect way to exfoliate and nourish your skin. My final skincare essential is the Vaseline Intensive Care Aloe Spray Moisturiser. I opt for a spray moisturiser in the winter months as it's far too cold to spend ages applying body moisturiser and letting it absorb. I'm currently using the Aloe Soothe moisturiser which has a super fresh and clean fragrance to it. I also really like the Cocoa scent! The product really helps to keep my skin moisturised and instantly leaves it feeling soft and refreshed. 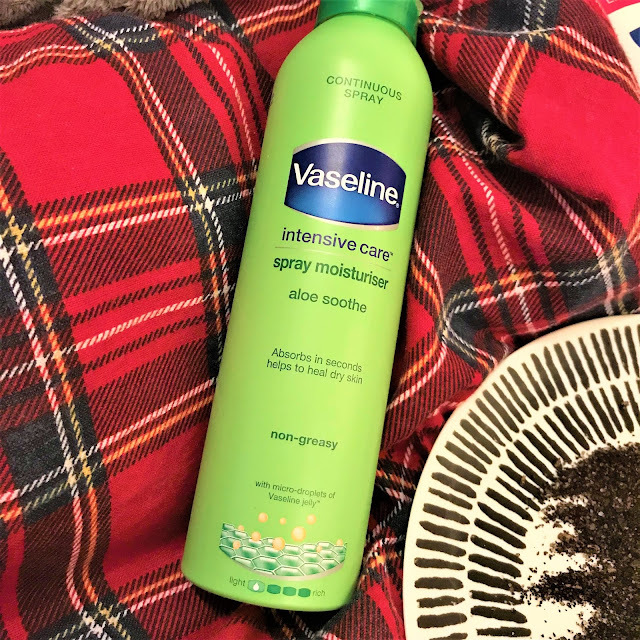 The best thing about this spray moisturiser is that it has non-greasy formula and absorbs into the skin in seconds, so there's no need to wait around before you put on your fresh clothes or pyjamas! When it comes to skincare, I'm pretty much 99.9% sure all my products come from the drugstore. 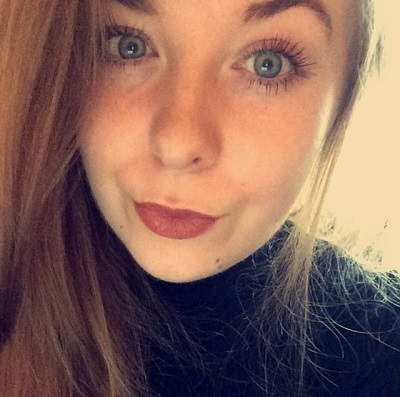 I've tried and tested so many products, which has allowed me to see what works and what doesn't for my skin type. This has also let me see if I want to repurchase the product, or try and find something similar that would be more suitable for my skincare needs. One product that I have been repurchasing time and time again has been the Superdrug Naturally Radiant Brightening Hot Cloth Cleanser. A cleanser infused with plant extracts, formulated to help give your skin a natural glow, as well as gently cleansing and exfoliating. It's very similar to the ever so popular Liz Earle Cleanse and Polish. I've used this before, and yes it's very good, but when you can get a similar product from the drugstore, at an affordable price, I know what I'm going for! - Kiwi Fruit Extract; a source of Vitamin C, which has great ability to help brighten and even out skin tone, as well as being an antioxidant protection against free radicals. - Mulberry Fruit Extract; has strong brightening properties which can help to reduce discolouration and even out skin tone. - Cocoa Butter; a rich emollient that is great for skin softening and conditioning. This cleanser has such a thick and creamy texture, which feels so soothing and luxurious upon the skin. The beautiful moisturising Cocoa Butter creates a rich and creamy formulation for the product that simply melts into the skin and cleanses away make-up and impurities. It leaves your skin looking more radiant and plump, as well as feeling silky and smooth. The scent of the Hot Cloth Cleanser is very spa-like. You know what I mean. It smells so fresh and clean, that I look forward to using every single night. A little bit goes a long way! You only need a 10p amount of product for your whole face. It's a dream to use. To apply, I squeeze a small amount of product into my hands, add a small drop of water and gently massage the creamy cleanser into my face. The cleanser is so gentle, it's perfect to use of the eye area to remove any mascara, and especially good for those with sensitive skin, like myself. After a couple minutes of massaging the cleanser into my skin, I would then rinse the muslin cloth or just a face cloth in hand-hot water and wring out before wiping off the cleanser, taking care around the eye area as the skin there is very delicate. Finishing off with splash of cold water to refresh the skin. Have you tried the Superdrug Naturally Radiant Brightening Hot Cloth Cleanser? What are your favourite cleansers? Recently I shared my thoughts on the Garnier Moisture Bomb Tissue Face Masks, which if you didn't know, they are GREAT! Garnier have since then released some new tissue eye masks with the same product concept as the face masks. I picked up the Garnier Eye Sheet Mask Hyaluronic Acid & Coconut Water and the Garnier Eye Sheet Mask Hyaluronic Acid & Orange Juice to see if they are just as good as the face masks. The masks are so quick and easy to use, you can use them pretty much anytime and anywhere. 1. To apply, simply open the packet, take it out and unfold the mask. 2. Apply to cleansed skin and smooth the mask gently over skin. 3. Adjust the mask to cover the full eye area. 4. Leave for 15 minutes and then remove. Gently massage the excess formula into the skin. Firstly I tried the Garnier Eye Sheet Mask Hyaluronic Acid And Coconut Water. This was the more tricky mask to apply, but once you placed it correctly, this mask worked like a treat. My eye area felt so refreshed. The skin cooling effect from the mask really worked, and I could already feel my skin becoming more hydrated and revitalised. After I removed the mask and patted in the remaining serum, it did definitely left my skin looking plumper and firmer. Secondly, the Garnier Eye Sheet Mask Hyaluronic Acid And Orange Juice. This was the mask I was definitely more excited for as I love products that make your skin look glowy and brightened. These under eye tissue masks were definitely easier to apply, and they were the perfect size. Again, the skin cooling effect really worked and you could feel the hydration right after application. These eye mask helped to leave my eye area look brighter, more refreshed and more awake. 10/10 It's a thumbs up from me! Have you tried the Garnier Moisture Bomb Eye Tissue Masks? Earlier this year, L'oreal Paris added a trio of Smooth Sugars Scrubs to their skincare range. I had already tried the Nourish Scrub and loved it, so i was 100% sure I wanted to try some more from the range. I picked up the L'oreal Paris Smooth Sugars Clear Scrub to test out, and see if it was just as good as the Nourish Scrub. The Smooth Sugar Clear Scrub is formulated with exfoliants of 100% natural origin, made from fine sugars and kiwi seeds. The expert blend also contains 3 fine sugars; White sugar that melts on the skin while gently buffing away impurities and dead skin cells. Blonde sugar, which is a natural moisturiser, and brown sugar which is rich in minerals that help strengthen the skin's barrier. A perfect combination of lemongrass and peppermint essential oils are also included to help purify and detox the skin, as well as banishing blackheads. In terms of application, I always use this on clean skin. I will use a face wash/cleanser to remove any makeup or dirt from the skin, then apply a small amount of the scrub to my face and lips. Adding a splash of warm water to help lather the product slightly and gently massage in a circular motion. The sugars really melt into the skin for a deep exfoliation and the kiwi seeds helping to tackle the pores. I use the Clear Scrub around 3 times per week to help maintain my skin and banish any blackheads or congestion. The L'oreal Paris Smooth Sugars Clear Scrub has quick a thick and sticky consistency, with the sugar and kiwi seeds providing the perfect amount of texture to help exfoliate the face, without being too harsh on the skin. The packaging feels very luxurious. A nice, compact glass pot, that does feel quite heavy; definitely feels more high-end than drugstore! - Smooth Sugar Nourish Scrub with Cocoa Butter to exfoliate, soften and smooth skin. I also reviewed the L'oreal Smooth Sugars Nourish Scrub. Some new additions into my skincare routine that I have been using for around 2 months now have been from the Superdrug Detox Skincare range. A selection of skincare products infused with Vitamin C; claiming to help brighten, revitalise and detoxify your skin. For me, these products have been perfect to suit and care for my current skin needs. Kakadu Plum – highest known ‭concentration of Vitamin C of any food on the planet. First up is the Vitamin C Brightening Eye Gel. A lightweight eye gel with a cooling rollable applicator, great at helping to brighten and de-puff eyes, and to get rid of dark circles and tired looking eyes. The gel feels hydrating and adds a subtle glow under the eye, perfect for those who want a brightened, and more highlighted under-eye area. I simply roll the applicator on my under eye area in light circular motions until fully absorbed, and lightly pat in any excess gel. The next product I have been using is the Vitamin C Nourishing Gel Moisturiser. ‭Upon application, the moisturiser has a super light, refreshing and cool gel texture that absorbs very quickly into the skin, helping to provide an instant glow and added hydration. The perfect moisturiser for those with dull, tired skin, giving an extra boost of radiance to your routine. It hydrates, softens and plumps my skin without making my face feel clogged up and greasy, has such an amazing fresh citrus scent and gives you that fresh faced look that is perfect for Summer! I like to use this after cleansing in the morning. I apply a small amount of the moisturiser to my face, I use a small dot of product on my cheeks, forehead and chin, and gently massage upwards and outwards using a circular motion until fully absorbed. The final product from the range I have been using is the Vitamin C Jam Face Mask. A thick and sticky textured face mask that contains natural White Sugar and Orange Peel; helping to gently exfoliate, purify and brighten the skin. Again, this skincare product is formulated with Goji Berry and Kakadu Plum that really helps to give an extra boost of Vitamin C to your skin and give you that fresh glow. A great product for all skin types. I've been using the Jam Mask twice a week. The scent is fresh and fruity but not too overpowering. I would spread a thin layer of the mask onto cleansed skin and leave for around 10 minutes. After the time is up, I use a small amount of warm water and gently massage into the skin before rinsing. Superdrug Vitamin C Eye Cream 15ml / £4.99. Other products featured in the range include Superdrug Vitamin C Booster 30ml and the Vitamin C Facial Cleanser 150ml. Have you tried the Superdrug Vitamin C Detox Skincare range? If you have always wanted to try out a quality sheet mask, I may just have the product that you have been waiting for... Let's take a look at a couple of the Moisture Bomb Tissue Masks I picked up recently from Garnier. Sheet masks originated from South Korea, a country known for their dedication to beauty and skin care. 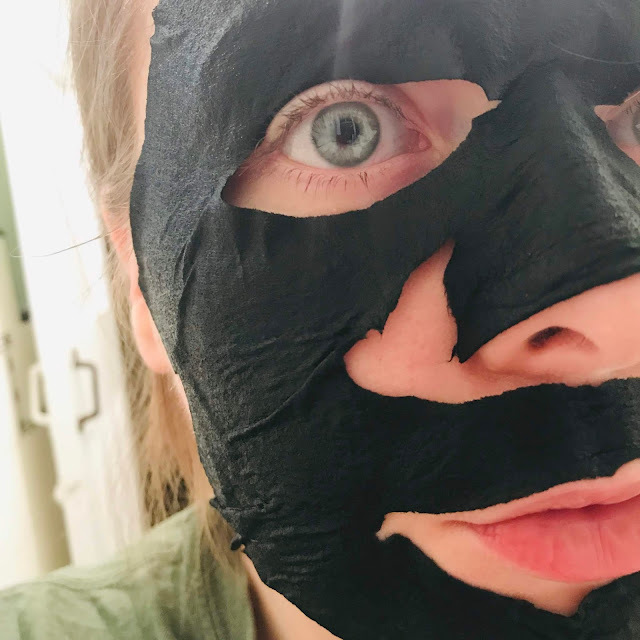 Since then, they have taken the world by storm, many beauty brands now have their own ranges of sheet masks and they are now widely available in both the drugstore and supermarkets. The beauty of sheet masks is that they can be used pretty much anywhere and anytime. A perfect wake me up for those tired mornings, an evening glow boost ready for your night out, or even on the go whilst travelling, they are definitely a great addition to any skincare routine. Instructions for use are super simple. The first product I picked up was the Garnier Skin Active Charcoal and Algae Hydrating Sheet Mask. Enriched with Black Algae Extract, LHA and Hyaluronic Acid, a perfect pamper product for those will oily/combination skin, as this helps to mattify, purify, and detox congested skin, as well as tightening enlarged pores. Black Algae Extract is packed with proteins, nutrients and amino acids. A natural ingredient known for its anti-ageing properties and treating dark circles under the eyes, as well as helping with skin elasticity and fine lines. These nourishing, yet soothing ingredients hydrate the skin’s surface, while the Charcoal works some magic by removing any impurities, to give a gentle, deep cleanse to the skin. Next up we have the Garnier Moisture Bomb Pomegranate Hydrating Face Sheet Mask. This has to be my favourite sheet mask that I have tried. Soaked in a super silky serum, enriched with Pomegranate Extract, Hyaluronic Acid and Plant Serum, this is a brilliant treat for those with dehydrated skin. Pomegranates are rich in vitamin C, a nutrient important for skin health, as well as packed with antioxidants and anti-ageing properties. What more could you want?! After using both these masks for the recommended 15 minutes, my skin looked super healthy and hydrated. It's amazing how my complexion looked smoother, plumper and more radiant in such a short space of time! These Garnier Moisture Bomb Tissue Masks contains one whole week's worth of hydrating serum, which will keep your skin looking moisturised, revitalised and nourished all day and all night long. Masks so good that I have repurchased more of these to try and test out as a weekly pamper treat, as they are so fuss-free and easy to use. I would highly recommend giving these mask a go! Have you tried the Garnier Moisture Bomb Tissue Masks? Which is your favourite?